LOCK HAVEN – The Clearfield Area High School softball team shook off the effects of a long bus trip and the bitter cold to defeat Brockway 3-0 Saturday morning at Peddie Park and warmed up again later in the afternoon to edge Altoona 4-2 and win the first Thunder of the Mountain Tournament. “It was freezing,” Lady Bison coach Bob Dixon said, quickly adding, “But they played really well. Against Brockway, Heather Picard struck out 15 to best Alexandra Wright in a duel of freshmen right-handers who matched five-hitters. Picard walked only one in her first shutout. Andrea Butler provided the only run Picard needed with a home run, her first, to right center in the third inning. Two of Wright’s four walks led to the two insurance runs in the sixth, Makenzie Moore coming through with a two-out single into left field to drive in Janell Zalno and Melinda Owens. Clearfield (3-5) lacked that kind of a hit in the title game, stranding 10 runners. “We led the whole way, but we just couldn’t get a key hit to break it open,” Dixon said. The Lady Bisons did get to Altoona’s Katie Mulhollem for 14 hits as Butler, B.J. 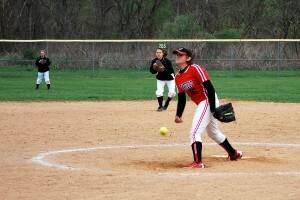 Bowman and Suzie Colesar had three apiece and Moore and Chantel Read added two singles apiece. Bowman singled for an RBI in the first inning and ripped a solo home run to left in the third after Butler had scored on an error. The Lady Lions (2-7), who had nipped host Central Mountain 8-7 in the other semifinal, got close when Brooke Kudlawiec’s RBI-single was misplayed in the lower third, but Picard held them at bay over the last four frames, finishing with a seven-hitter. “On a cold day like that, it was tough, and she started getting tired and losing location,” Dixon said. “Her balls were drifting up. We weren’t having much success with the changeup, and her drop curve wasn’t working. Moore singled home Bowman with the final Lady Bison run in the fifth. Dixon believes the championship trophy might be the first won by a Clearfield softball team at an in-season tourney. Central Mountain (1-7) defeated Brockway (1-5) in the consolation game. Clearfield will travel to Williamsport Monday and host St. Marys Wednesday in Central Penn League action. Andrea Butler ss 4230, Janell Zalno lf 2000, B.J. Bowman 4232, Suzie Colesar 1b 4030, Melinda Owens 2b 2000, Chantel Read 2b 2020, Makenzie Moore c 3021, Rachel Cordon dp 4000, Mia Keener 3b 3010, Makayla Ebeling rf 3000, Heather Picard p (flex) 0000. TOTALS: 31 4 14 3. Kayla Montgomery ss 4000, Madeline Berry 2b 3110, Brooke Kudlawiec c 3021, Didi Rizzo 3b 3010, Kristie Mulhollem p 3000, Kasey Hatch 1b 3010, Katie McMillen dp 3010, Tiffany Turner rf 3010, Alexia Weyandt cf 2100, Amber Kidd lf (flex) 0000. TOTALS: 27 2 7 1. Errors – Zalno; Berry. PB – Moore 1; Kudlawiec. DP – Altoona 1 (Hatch and Berry). LOB – Clearfield 10; Altoona 5. HR – Bowman (1). Sac – Zalno 2. SB – Butler, Bowman. CS – Turner (by Moore). Clearfield – Picard 7 IP, 7 H, 2 R, 1 ER, 3 BB, 1 K.
Altoona – Mulhollem 7 IP, 14 H, 4 R, 3 ER, 1 BB, 3 K.
W – Picard (3-3). L – Mulhollem (2-5). Sarah Anderson 3b 4020, Zoe Hawkins lf 3010, Ann Moyer cf 3000, Michelle Mancuso 1b 3010, Jalina Sabatose ss 2000, Jackie Brosky 2b 2000, Savannah Brosky c 3010, Alexandra Wright p 2000, Alyssa Daub ph 1000, Jordan Inzana dp 2000, Betting ph 1000, Julie Vokes rf (flex) 0000, Brittany Johnson rf (flex). TOTALS: 24 0 5 0. Butler ss 3121, Zalno lf 2100, Bowman cf 3000, Colesar 1b 2010, Owens 2b 1100, Moore c 3012, Keener 3b 3000, Read dp 2010, Ebeling rf 2000, Picard p (flex) 0000. TOTALS: 21 3 5 3. E – Owens. PB – S. Brosky 2; Moore 1. LOB – Brockway 7; Clearfield 4. D – Colesar. HR – Butler (1). SB – Owens. CS – Butler (by S. Brosky; Read (by Brosky). Brockway – Wright 6 IP, 5 H, 3 R, 3 ER, 4 BB, 4 K.
Clearfield – Picard 7 IP, 5 H, 0 R, 0 ER, 1 BB, 15 K.
W – Picard (2-3). L- Wright (1-2).